Hello, Altenew friends! It’s Virginia here. 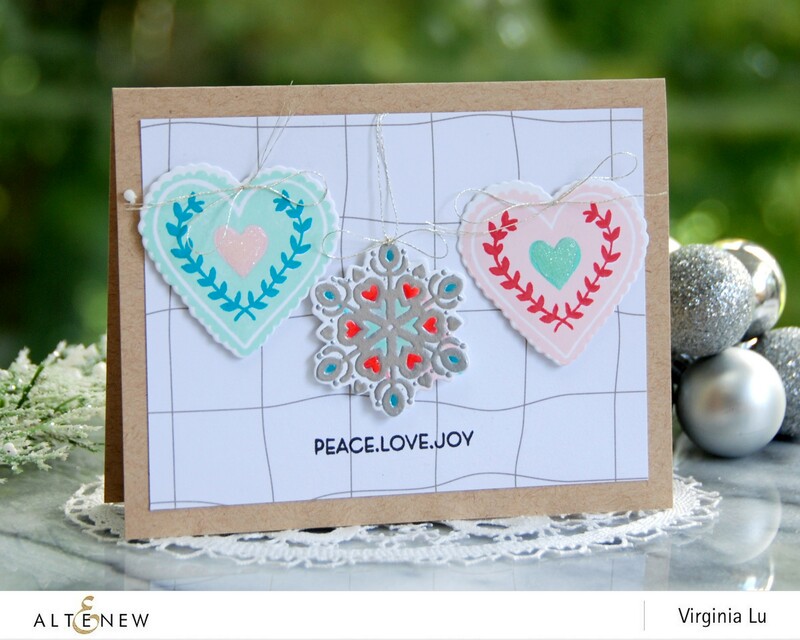 I am sharing 3 projects with one of the finest stamps set from our October 2018 release – the 4″x6″ clear stamp set, Peace Love Joy, which comes with the iconic homespun Christmas images. 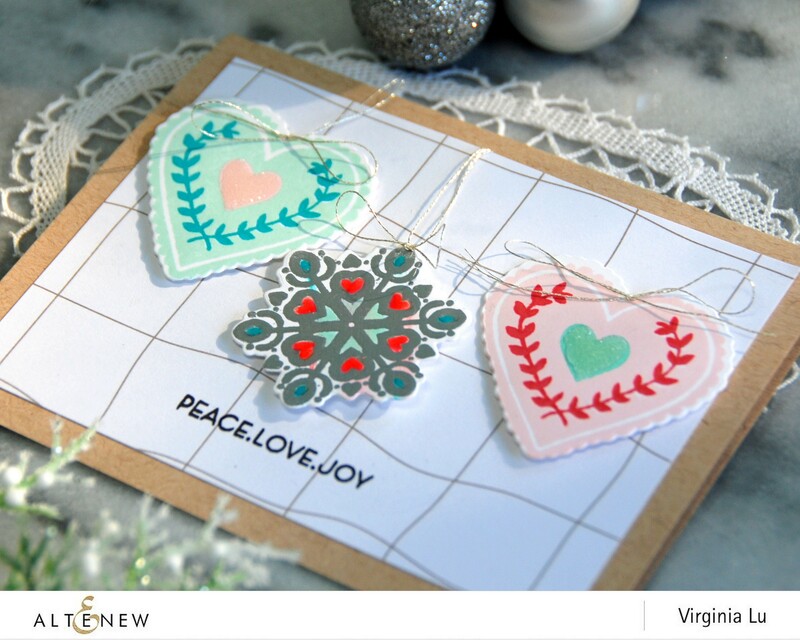 The Peace Love Joy Stamp & Die Bundle makes it fun and easy to create! I actually came up with many ways of using this stamp set and now I am sharing my favorites with you. By following the insert from the packaging, I stamped the images with some lighter shades of colors (Mountain Mist, Teal Cave, Blush, and Vineyard Berry). To add a bit of shine, I embossed the snowflake in Antique Silver Embossing Powder and colored the heart with Artist Markers Set C (Crimson)! I then assembled them with silver strings and popped them up over the patterned paper from Celebrate You Kit. I also love how Altenew’s Parchment Cardstock provides the instant warmth and cozy feel to the overall design. Since I love the snowflake image so much, I stamped the background with Cool Summer Night Oval Set. The sentiment from Classic Alphabet really takes the card to another level. 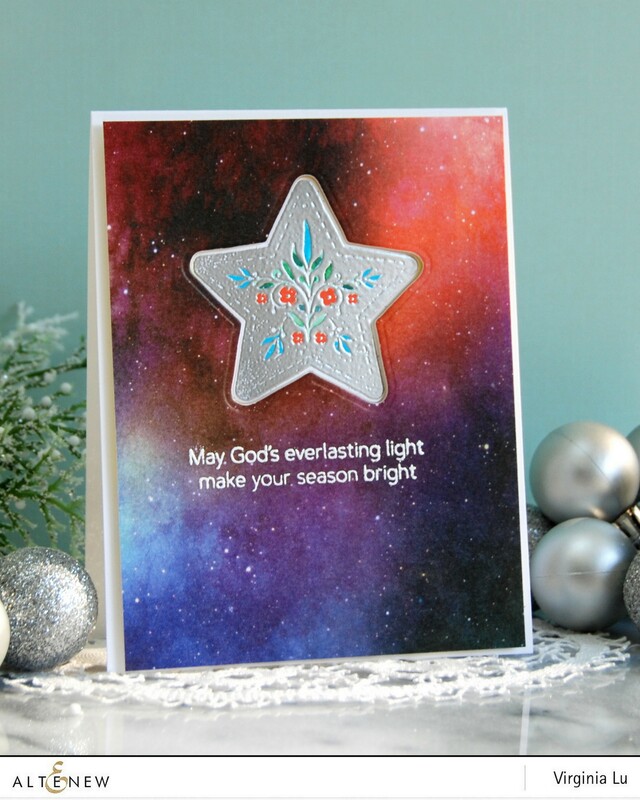 The word “JOY” was created with white “Emboss Resist” with the snowflakes and Altenew’s Watercolor Brush Markers. I covered the background with a piece of Vellum Translucent Paper by applying Glue Tape behind the word “JOY”. My last card is a clean and simple one. 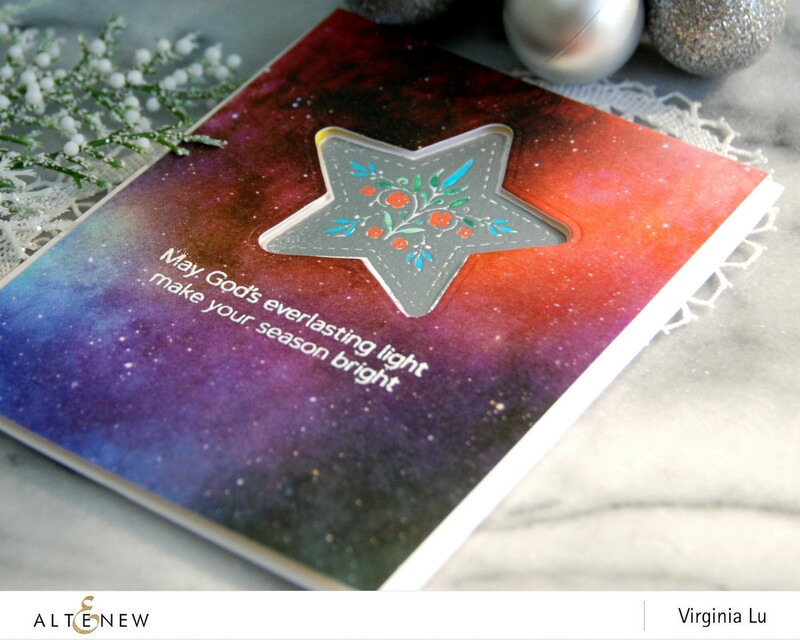 A bit of silver embossing, die-cutting, and a washi tape (Watercolor Nebula) will do the job! First, I applied the Watercolor Nebula to the Classic Crest Solar White Cardstock and trimmed it to 4 3/4″ x 5 3/4″. 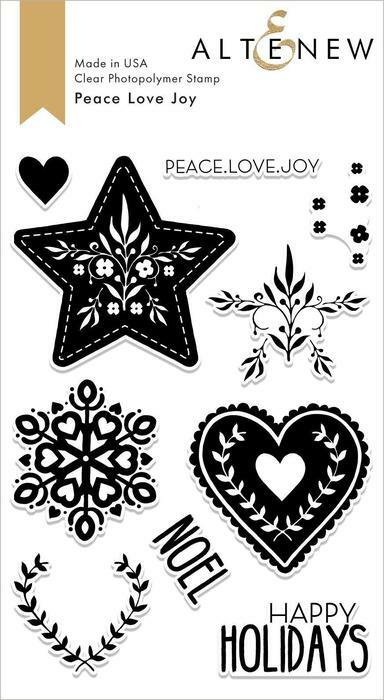 Then I positioned the star die from Peace Love Joy Die Set and made the die-cut. I white-embossed a sentiment from Blessings Stamp Set to the washi tape and that worked like a charm! 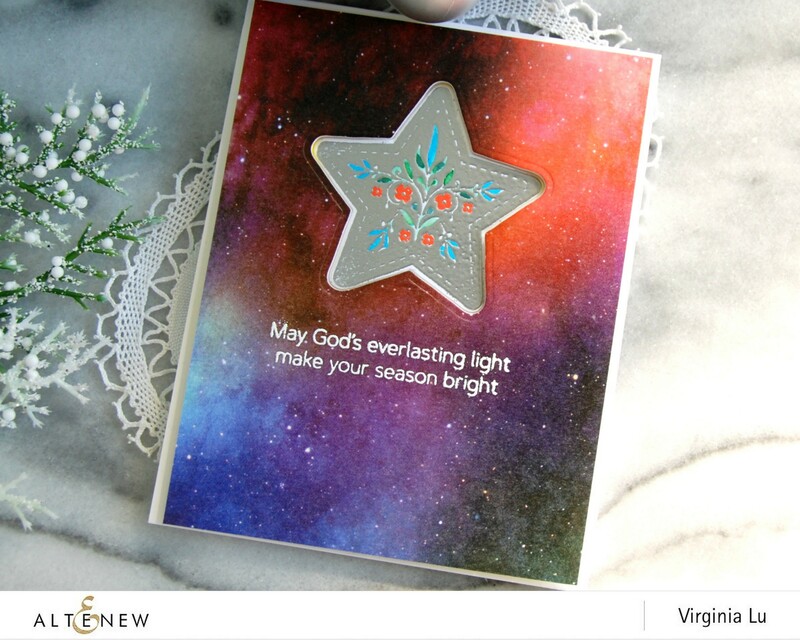 With the star cut out in place, I positioned the stamp and embossed the star in Antique Silver Crisp Embossing Powder. I colored the fine details of the star with Artist Markers and this card is done! The Watercolor Nebula piece was popped up with foam tape. This little detail took the design to another dimension! 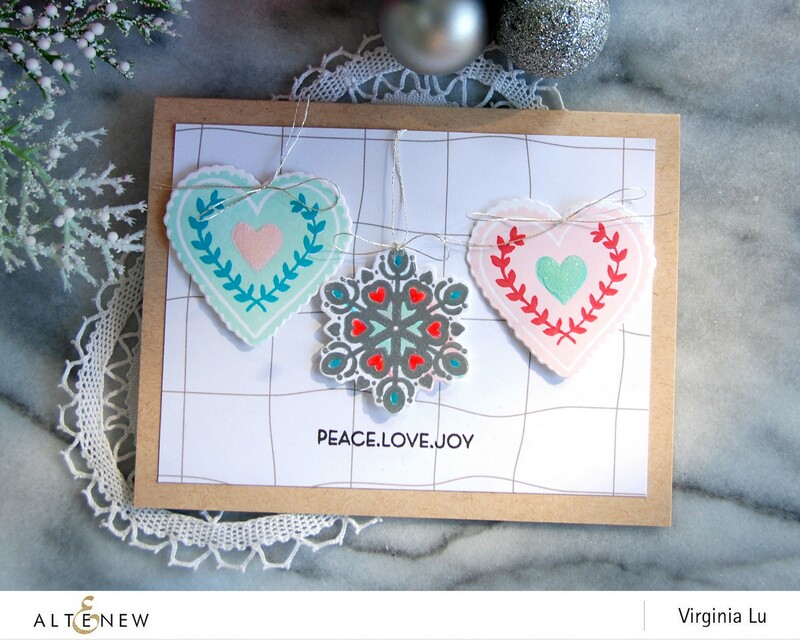 I hope today’s cards with the Peace Love Joy Stamp and Die Set inspired you. I bet you now have more creative ideas swimming in your head at the end of this post! Thank you and have a JOYful day! Beautiful cards with this pretty stamp set! I love the style of the designs! Thanks so much for the comment! It was fun to come up with various designs with one stamp set! I love these beautiful products you have showcased! Awesome cards! Thank you for stopping by, Kirsty! I like the variety of cards you made with this set.